Kofi Annan was born on April 8, 1939 in Kumasi, Ghana, to an elite family. His parents, Henry Reginald and Victoria Annan, are from the two major ethnic groups that make up the Akan -- one of the groups of indigenous people of Ghana. 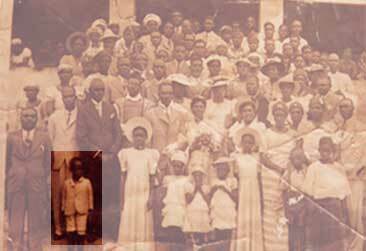 A young Kofi Annan in a family picture. Kofi, whose name means "born on a Friday," also had a twin sister, who died in 1991 from a still yet unknown disease. In Ghanaian culture, twins are considered special and are adored. Kofi Annan probably got his first lessons in politics and diplomacy early on from his family. Both of Annan's grandfathers and his uncle were tribal chiefs. Upon his retirement, Annan's father, who worked as an export manager for the cocoa exporter Lever Brothers, was elected governor of Ghana's Asante province. In 1954, Annan attended Mfantsipim School, an elite Methodist boarding school in central Ghana established under British rule. The Secretary-General credits the school with teaching him "that suffering anywhere concerns people everywhere." At Mfantsipim, Annan led the student body in a hunger strike to get better food from the school cafeteria. It was a success. In the early 1950s, while Annan was at boarding school, Ghana was undergoing radical changes. Under the leadership of Kwame Nkrumah, a movement for independence was gaining ground and by 1957 Ghana had become the first British African colony to gain independence. "It was an exciting period," Annan told The New York Times, "People of my generation, having seen the changes that took place in Ghana, grew up thinking all was possible." The people of Ghana are extremely proud of Annan and regard him as their hero. Whenever he visits his homeland he is mobbed by fans who respectfully call him "Father." Ghanaian leaders also hold Annan in high regard. The Asante King has even given him a title usually limited to kings -- "Busumuru,"
meaning "wise advisor." Annan has also been asked to serve as paramount chief of the Akwamu region in eastern Ghana (which he declined). Born on April 8, 1938 in Kumasi, Ghana. Attended an elite boarding school in Ghana. Enrolled at the University of Science and Technology in Kumasi, Ghana.